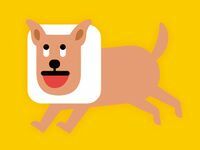 Undodog as he appears in Super Mario Maker. He reappears in Super Mario Maker with the same function as his original appearance: reverting the player's last edit. In this appearance, he wears a white box resembling an Elizabethan collar instead of a black box. He also appears throughout the game outside of the course editor such as in the game's manual with Mary O and Yamamura, riding a rocket in the background in Course World and when a player completes the 10-Mario or 100-Mario Challenges, and in the corner during Gnat Attack. When 10 seconds remain on the timer in Gnat Attack, he'll start barking and jumping excitedly. If the player shakes the heart SFX, its icon will turn into Undodog wearing a surgical face mask. This SFX will cause static to appear briefly with a buzzing sound followed by the course's music turned off temporarily (or permanently, if it is equipped to Mario). The icon and the music being turned off is a throwback to Mario Paint where the bottom lever in the background music option has a similar appearance and effect when selected. A special event course titled "Walkin' with Undodog" also exists. He reappears in Super Mario Maker for Nintendo 3DS and Super Mario Maker 2. Undodog makes cameo appearances in the WarioWare: Touched! microgame, Mario Paint, and his icon can also be seen in the WarioWare: D.I.Y. microgame for Mario Paint. Sprite of the Undodog costume. Undodog riding Lakitu's Cloud with Mary O and Yamamura. Undodog represents the sound effect for silent BGM. Undodog's appearance at the end of 10 Mario Challenge. Watching Mary O trying to pull up a Thwomp with Yamamura. The Mario Artist series also uses a dog's head as the "undo" icon; however, the dog bears more resemblance to a beagle than it does to Undodog and may not be the same character. While Undodog himself does not appear in Super Smash Bros. for Wii U, his sneezing sound effect is incorporated into the "Mario Paint Medley" music track. This page was last edited on March 26, 2019, at 00:09.